As the title suggests the boatyard’s location was unlikely, being a mile from the nearest water if you don’t count the kitchen tap. The yard was also known as Watling’s on account of it being on Watling Street in Stony Stratford, Buckinghamshire. It dated from 1862 when a nearby concern moved to Crewe leaving skilled manpower behind and creating the commercial opportunity. 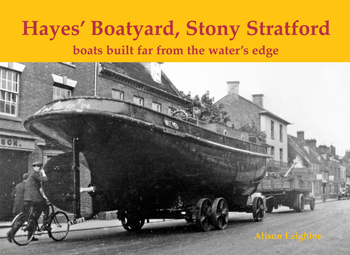 Hayes’ yard built boats for over 50 years, exported all over the world, and at its height had 90 employees. Although the photographs in the book are of mixed quality they are all extremely interesting and accompanied by informative captions.